Astronomers have mapped out the relative values of our nearby galactic gravitational pools. Of course, these pools coincide with huge global cluster galaxies that are all part of a large complex system of giant galaxies. And the suspicion that the universe isn't flying apart but is being sucked into these several giant monster gravitational pools is just beginning to trouble the sleep of astronomers who were raised on the theology of 'the universe is flying apart faster and faster'. Astronomers create a most interesting gravitational map of our nearer parts of the universe. BBC: Astronomers have produced their biggest 3D map yet of the "local" Universe. They have detailed the positions of all the galaxies, and galaxy groupings, out to a distance of about 600 million light-years from Earth. Some astronomers had previously argued it was heading towards the Shapley supercluster - a truly massive assemblage that is 20 million light-years across. Looking at the universe through the wrong analogies leads to not understanding what is right before one's eyes. Thinking of the data we see as 'sheets' and 'filaments' disguises the truth of the matter. Namely, all this is actually energy and matter following the contours of the gravitational pools. When we watch water moving on earth, we can see what is shaping it since the earth itself is visible to our eyes. But imagine trying to understand how water flows if we couldn't see the landscape, only the water? Wouldn't it look mysterious to see water rushing downhill and suddenly going in a very tight stream that looks like a 'filament' but is what we call a 'waterfall'? Note the word 'fall' here. If everything is falling into everything else, one should expect the underlying structure of space to funnel the falling galaxies and their energy envelopes into narrow channels before it plunges off the cliff and into the deep, bright pools that are swallowing up all the universe. Water that is flowing onto a plain, on the other hand, spreads out and grows less and less deep until it soaks into the soil and dissipates. 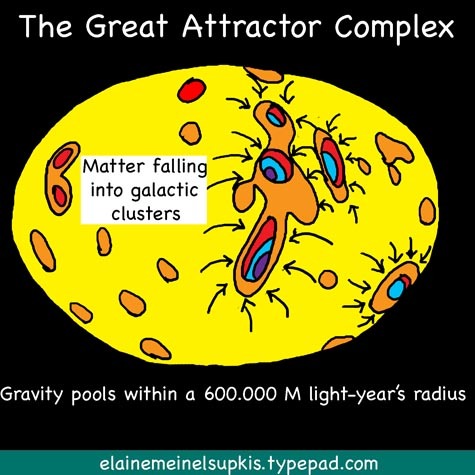 Yet when we look at the gravity maps as well as the galaxy charts of our universe, one sees increasing concentrations of matter, not dissipation. If we could suddenly see the invisible landscape that is shaping our universe, I am betting we would be very startled to see these yawning canyons with gigantic waterfalls as the 'water' of the rest of creation flows thunderously over the precipice and down into the mist-shrouded depths. This is why I am making a plea for astronomers to change their imagery. They need to be more creative and like Einstein when he ceased to think of the universe in an earth-sun concentric way, so it is with all the amazing data pouring in that clearly shows, without the slightest doubt, that our universe is not expanding rapidly but is flowing down into the mega-galaxies that contain most existing matter. Here is a related story about how many stars have captured 'planets'. TWO Jupiter-sized worlds have been discovered by British-led astronomers using a new technique that spots planets moving in front of their parent stars. The planets, orbiting stars in the constellations of Andromeda and Delphinus, were the first to be found by the UK-led SuperWasp (Wide Angle Search for Planets) programme. SuperWasp astronomers have been using high-quality, wide-angle cameras to survey several million stars looking for the tiny dip in starlight caused by a planet passing in front of its star. There are many, many stars like Twin Spica where they wildly circle each other in a dance of death. Smaller objects are subjected to this, too. The whole galactic system of our Milky Way is a giant rotation inwards, too. So I would think a general rule of this universe is, all matter is falling into greater concentrations of matter. What's the matter with that concept? Heh. Seems pretty darn simple to me. Here is a fine New Yorker article debunking the String Theorists. It is the best of times in physics. Physicists ar on the verge of obtaining the long-sough Theory of Everything. In a few elegan equations, perhaps concise enough to b emblazoned on a T-shirt, this theory will revea how the universe began and how it will end The key insight is that the smallest constituent of the world are not particles, as had bee supposed since ancient times, but “strings”—tiny strands of energy. By vibrating in differen ways, these strings produce the essentia phenomena of nature, the way violin string produce musical notes. String theory isn’t jus powerful; it’s also mathematically beautiful. Al that remains to be done is to write down th actual equations. This is taking a little longe than expected. But, with almost the entir theoretical-physics community working on th problem—presided over by a sage in Princeton New Jersey—the millennia-old dream of a fina theory is sure to be realized before long. I am not going into the entire article. I will only say, the writer is 100% correct. String theory has turned into a snarled tangle of twine. This comes from viewing the universe as a solid and not a fluid. The 'strings' are really STREAMS and our ancestors, when they talked about the stars as if they were water, were correct after all. The Milky Way was viewed as a mighty river and the rising and setting of the stars were viewed as rising out of the sea or falling into the ocean. Indeed, this is embodied in many myths which is why the planet/star Venus rose out of the sea, for example. Modern astronomers are taught to make fun of ancient knowledge and thus lock their brains out of the great mass of creative thought which has led them to make many mental mistakes when trying to imagine the way the universe carves its ecosystem. Indeed, just like fish and whales follow currents as they swim along, just as birds sculpt their flight by catching the various winds and blusters with their sensitive wing feathers, just like butterflies merrily boggle along in the summer breezes, so it is with those 'strings'. It is interesting watching male butterflies mob a female that is spreading her harmones in the various breeezes. They form an interesting spiral that is a fine 3-D replication of a global cluster. Sitting on the tractor in my hay fields, watching the female butterfly accumulate males until they form a cluster that is thousands of insects, so it is with our universe. The great forces that surround all living things on this planet are just like the ones that surround all the galaxies. Instead of becoming weaker, they grow stronger. Just like dying stars don't grow weaker, their cores probably increase their speed and activity until they blow away everything in their vicinity in an awful, volcanic blast! The gas and dirt from these explosions don't fly off into space and disappear. They become part of the greater galaxy and continue to rotate towards the collection of black holes that fuel all the galactic gravitational pools. And lastly, there is no medicine that will fix the 'eyes' of our dear Hubble Space Telescope. The Advanced Camera for Surveys, installed by a space shuttle crew in March 2002, increased Hubble's vision 10 times and has given the clearest pictures yet of galaxies forming in the very early universe. The instrument consists of three electronic cameras, filters and dispersers that detect light from the ultraviolet to the near infrared. The orbiting Hubble telescope, launched in 1990 by the space shuttle, has revolutionized the study of astronomy with striking images of the universe. Using images from the craft, scientists have determined the age of the universe and discovered the mysterious dark force that is causing all of the objects in the universe to move apart at an accelerating rate. However, a servicing mission by the space shuttle is needed to install two new instruments as well as fresh batteries and gyroscopes to keep the aging telescope working until 2011 or 2012. NASA, which has not decided whether to schedule a servicing mission, is planning to replace the Hubble with a new, improved version, called the James Webb Space Telescope, scheduled for launch in 2011. NASA scrubbed the servicing mission because of safety concerns following the loss of the shuttle Columbia in 2003. That decision prompted an outcry from scientists and the public and forced NASA to reconsider. Gads. We see the few remaining launchings of the Space Shuttle wasted on all sorts of stuff when the important work languishes. I would rather we terminate the entire enterprise if we are going to screw this up. Priorities! I want to see the universe. All this incoming data is absolutely fascinating.